A Black Moor goldfish who had a swollen, bloated abdomen. 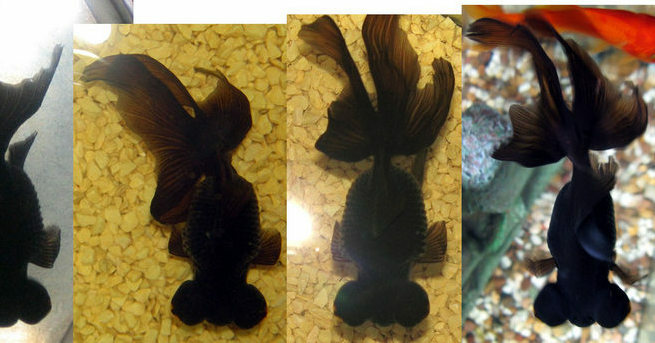 Home / Articles / Pet Health / Case Studies / Wishy-Fishy, a Black Moor goldfish who had developed a swollen, bloated abdomen. Elise has kept pet goldfish for just over a year. She chose her fish at the local pet shop, selecting one standard orange goldfish, two guppies and Wishy-Fishy, a Black Moor. She set up the fish in a medium sized tank in her bedroom. The Black Moor is a type of goldfish that’s been bred over the years to have an unusual appearance. Black Moors are the same species as standard goldfish, but they’re a different breed, in the same way as a Pekingese is a different breed of dog from a farmyard collie. As well as the black colour, they have an body shaped like an elongated egg, large protruding eyes and long flowing fins. Unlike some types of fancy goldfish, Black Moors are considered to be good for people who are new to fish-keeping, because they’re hardy, and are able to cope with a wide range of water temperatures. They can happily share a tank with other fish..
Elise set up her fish tank in the ideal way, with a filter, an aerator, some oxygenating plants, and some tank “furniture” for the fish to swim in and out of, to make their lives more interesting. She fed the fish small amounts once daily. She did her best to keep the water as clean as possible, changing a quarter of the tank volume every week, and giving the whole aquarium a complete clean out and scrub down very few months. All of the fish thrived at first, but at the beginning of October, something went wrong with Wishy-Fishy. His body shape changed, becoming even more spherical than normal, so that he was shaped more like a ping-pong ball than a goldfish. His scales lost their normal smooth, shiny appearance, beginning to stick out like a half-opened pine cone. 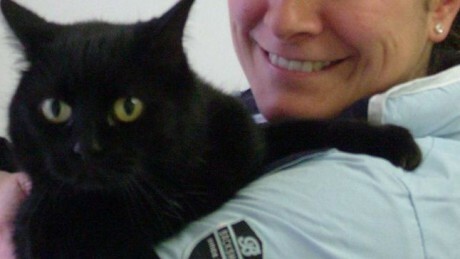 At first she thought he’d just become fat, but his condition deteriorated, so I was called in to help. 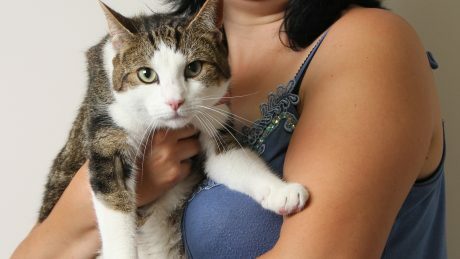 Wishy-Fishy had a problem known as “Dropsy”, where the fluid balance in his body had gone wrong, so that water was building up in his body in abnormal quantities. There are many possible causes, including bacterial infections, but water quality is often also to blame. To work out what was going on, I carefully checked out the precise details of how Wishy-Fishy was being looked after. Elise had her fish tank set up perfectly, but there was one problem: it had been the right size when she’d bought her fish, but as they’d grown, it had become too small for the size of her fish. The rule of thumb is that one inch of fish should have 24 square inches of surface area at the top of the tank (4 inches by 6 inches). As Elise’s fish had grown longer, the tank had become too small for them, and the water quality was beginning to suffer. That’s what had made Wishy-Fishy fall ill. In the short term, the sick fish needed treatment. He was put into a “hospital” tank, separate from the other, healthy fish. The water in this tank was given a salt treatment, bought from a pet shop, which would have an anti-bacterial effect. Wishy-Fishy lived in this tank on his own for a full month, and his body shape gradually returned to normal. Meanwhile, a much bigger tank was bought for all the fish to live in, carefully measured to take account of their new adult sizes. Once he’d made a full recovery, Wishy-Fishy returned to live here with his friends. He’s now back to being a strong, healthy Black Moor, happily enjoying the extra space and better water quality of his new home. 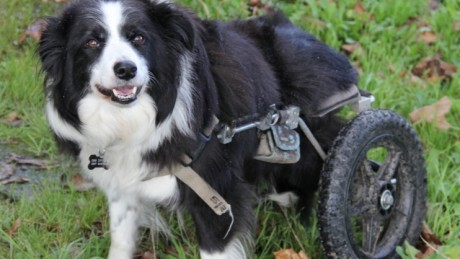 Mollie is a collie whose back legs were paralysed after an accident. Black moor goldfish & regular gold colored goldfish died because didn’t realize didn’t rinse out soap from smaller tank while cleaning main one. Had no idea how to save them. The black moor died a lot quicker. Think the regular gold colored goldfish mostly died of a broken heart. Ugh.